Be a hippie and wear your baby. The carrier hides any baby weight you think you’re carrying around. This leaves your radiant new mom face, buff arms and legs, and of course everyone is looking at the baby anyway, so relax. Since I’m a safety girl, I recommend the Ergo Baby carrier since it allows baby’s legs to cradle you like a little monkey. This is in contrast to the Baby Bjorn, Snugli and other front carriers that make your baby’s legs dangle. In construction, my day job, if a worker takes a fall in their harness, we need to rescue them right away to avoid suspension trauma. When I see babies in Bjorns and Snuglis, I see suspension trauma! I’m no doc, but there’s info out there on front carriers. Educate yo’self. Don’t forget to stretch! The awkward postures of mothering wreaks havoc on your back, hips, shoulders, everything. Also, don’t forget to be in front of the camera once in awhile. 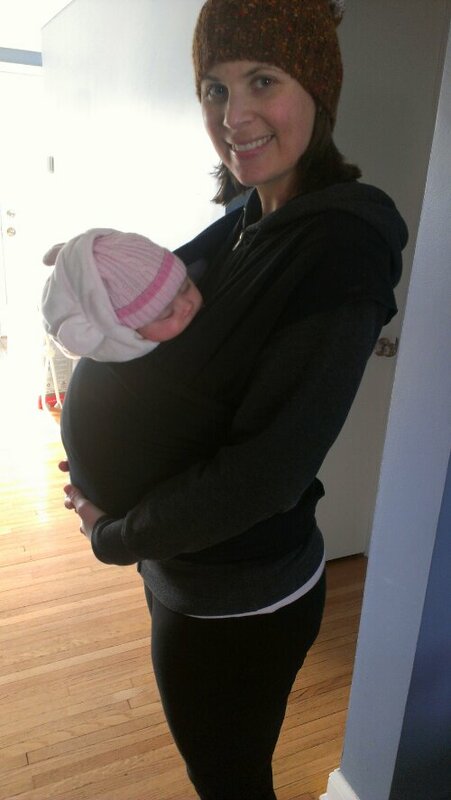 I don’t have a picture of us using the Ergo Carrier, so here’s a pic from about 2 months post-partum using the Moby Wrap, another great ergonomic baby carrier allowing for the baby to be in a natural position.